A local firm are currently looking for an enthusiastic, hard working administrator to join its team at their Longford office. 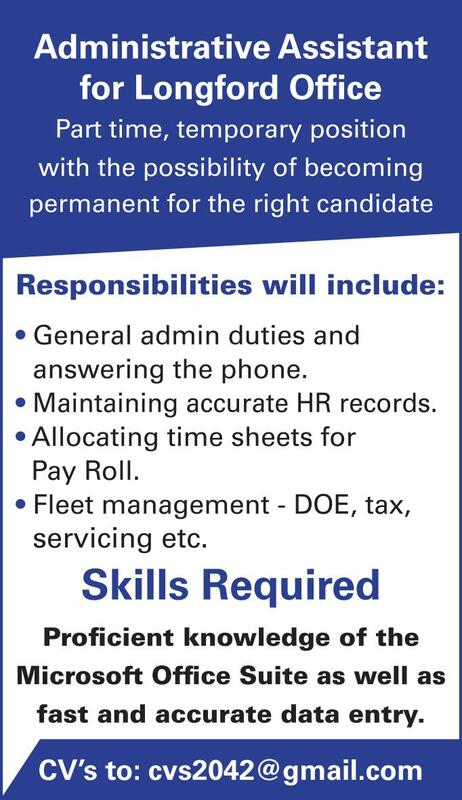 This company is constantly growing and now feel the time is right to recruit somebody new to join their office team as an Administrative Assistant. The successful candidate will start off as a part time temporary employee with the possibility of becoming permanent for the right candidate. * General admin duties and answering the phone. This is an exciting opportunity for an enthusiastic, driven candidate. Please provide a brief cover letter detailing your experience and your CV along with two valid referees.